We do not wear armor when we ride a motorcycle because we plan on crashing. If that were the case I would wear a t-shirt and jeans with a pair of Chucks and just never plan on crashing. Instead, we wear armor to protect us in the event of a crash and work every day on improving our riding abilities to help avoid accidents. However, as the old adage goes, “Accidents happen”. My faithful Triumph Bonneville still bears the scars of my first tumble on two wheels. After college I had moved out to Los Angeles in search of a teaching position. I had taken a job as a Director of Education running a Sylvan Learning Center mainly because it featured a four day work week. This left me with three day weekends with which to explore the far reaches of the Californian deserts and mountain ranges with my Bonnie. It was during one of these weekend adventures that I had taken a lady friend on a ride up into Topanga Canyon located in the mountains north of Malibu and outside the bustle of the city. I planned the ride for sunset and took her up Los Flores Canyon Road to this little overlook where you can watch the sunset over the beaches of Malibu below. Upon reaching the vista at the top of the mountain I was feeling pretty good about how the evening was progressing. As I pulled my Bonnie to the side of the road she tried to dismount the bike before I had come to a complete stop. Her foot caught on the seat and as she fell over she took me and the bike with her. I ended up with my right leg pinned under the bike as I watched her sail right over the guardrail and tumble about 30 feet down the side of the mountain into the canyon below. Gentleman, in case you have any doubt in your mind, let me promise you this: It does not work in your favor when trying to impress an attractive young lady to push her down the side of a mountain. If you disagree with this statement you are doing something wrong, write me, we can talk about it. In the end we were both wearing the proper safety gear and other than a few scrapes on the Bonnie and a few bruises to the ol’ ego, we both ended up being “OK”. It is better to be wearing the proper safety gear and not need it than to need it and not have it. This was the thinking that led to the new NeT Replacement Armor from Forcefield. With this new line of armor, Forcefield makes it more comfortable than ever to make sure you are protected in the event of a crash. Already a leader in the industry, Forcefield Armor is introducing a whole new line of armor for the Spring of 2014. NeT Upgrade Armor will be a premium option for riders looking to replace their existing armor. The new protection will have a maximum thickness of 9mm as well as the utmost flexibility with the rider’s comfort, as well as safety, taken into account. Mind you, safety is not sacrificed to achieve comfort, as the new NeT Armor maintains the same RPT (Repeat Performance Technology) we have come to expect from our premium motorcycle protection. 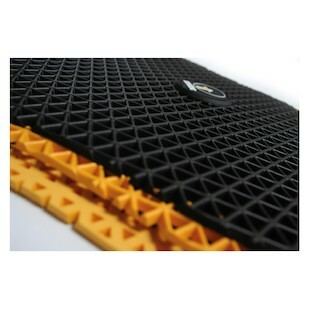 Forcefield will be introducing NeT armor in both a Standard, “Pre-moulded” version, as well as a Flat, “universal” version. 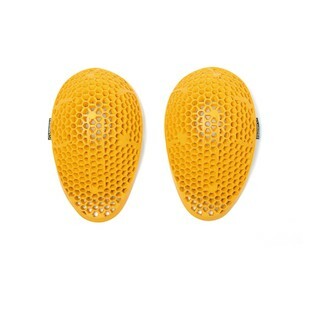 It will be available as both Forcefield Net Shoulder armor and Forcefield Net Elbow/Knee armor. 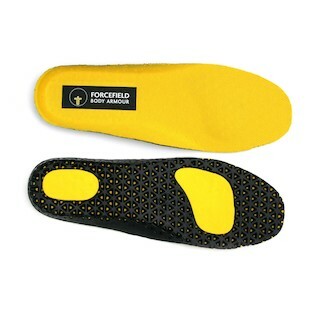 You will also be seeing Forcefield Roots Insoles using similar technology for extra support and impact protection for the soles of your feet. Both versions will offer the utmost breathability, perfect for both the deserts of Africa or the Urban Jungle which is Los Angeles. Forcefield recommends removing your existing armor and measuring it to determine if the Standard armor will work in your favorite jacket or pants. If you determine that the Standard will not fit, then the new Forcefield Net Flat Shoulder or Forcefield Net Flat Elbow/Knee armor will be the way to go. It is cut in a way which will allow riders to manipulate the shape in order to make it fit almost any application. Although CE 2 certification has not yet been standardized for Shoulder, Elbow, and Knee protection, the new NeT armor is designated as “PREN1621-1 Level 2”. This means it is pre-approved to meet the new Level 2 standards when they are released. With that being said it only meets these new standards in Ambient, Cold, or Wet conditions. During high temperature testing it reverts to Level 1 standards due to the composition of the material. Last week I was having a conversation with fellow RevZillian, Eric, about the merit of chest protectors. We are both relatively spirited riders, Eric probably more so than myself, and I was commenting about how, even at track days, I have never used chest protection. Eric argued that he was a fan of any product which offers additional protection to a rider in the event of a crash. He followed it up by saying he recommends using the maximum amount of armor that an individual feels comfortable with. This is one of the most solid points on the subject I have heard to date. 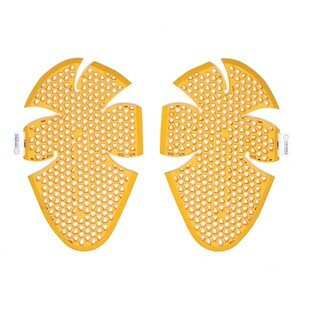 For example, there is no point in dropping $200 on a stand alone back protector, instead of a jacket insert or other replacement armor, just to leave it sitting in your closet when you go out for a ride because it is uncomfortable or inconvenient to wear. This is what Forcefield is setting out to prevent with its new NeT Replacement Armor. They want you to be comfortable wearing your protective motorcycle gear in all riding scenarios because armor can only protect you while you are actually wearing it. Accidents happen, and they happen when you least expect them. One minute you think you are being suave, carving up a canyon road at sunset to impress a girl, and the next minute you are climbing down the side of a mountain to help a girl out of the mud. I learned a lot from this experience, nothing more than the importance of making sure you and your passenger are wearing the proper safety gear during all rides. I also learned not to expect the rest of a date to go smoothly when you start it off by throwing the girl down the side of a mountain. Perhaps that is the most important lesson.